Rajasthan is a beautiful amalgamation of the old and new; the ancient and the modern. Rajasthan, or the Land of Kings, is true to its name with lavish forts and majestic palaces that are apt reminders of a rich, romantic past that speaks of heroism, honor and chivalry. After Breakfast check out the hotel and proceed to Jaisalmer by road – Famous for its carved havelis. On arrival at Jaisalmer check in the hotel and relax for some time. Evening is at leisure for your individual activities. Overnight stay at the hotel. After Breakfast proceed to full day sightseeing tour of the city covering the stunning Jain temples inside the Sonar Quila. The palace museum inside this fort exhibits a rich collection of imperial dresses and artefacts belonging to the royal family of Jaisalmer. You will see havelis with convoluted designs and latticed windows such as Patwaon-ki-Haveli and the Gadisar Lake, which are a treat to watch during sunset. Later, in the evening, drive away from Jaisalmer to the sand dunes and enjoy the camel ride /camel cart ride to the Sunset Point and Sam Sand Dunes. Later in evening return back to the hotel. Overnight stay at the hotel in Jaisalmer. Today is last day of your Royal Rajasthan with jaisalmer 7 Nights Packages check out the hotel and proceed to jaipur airport to board a flight for your onwards journey. Round-trip economy class airfare to Jaipur from all city except Delhi. Volvo tickets will be provided from Delhi – Jaipur – Delhi, if guest takes package from Delhi. Return transfers from airport to hotel in air-conditioned on sharing basis except luxury package. All sight-seeing as per itinerary on sharing basis in Deluxe and Premium category package. All transfers and sightseeing by private car in luxury package. Jeep ride at Amer Fort, Jaipur. Dinner at Chokhi Dhani, Jaipur once during the stay. Accommodation for 07nights in /AC rooms. Meals: 7 breakfast and 7 Dinners. 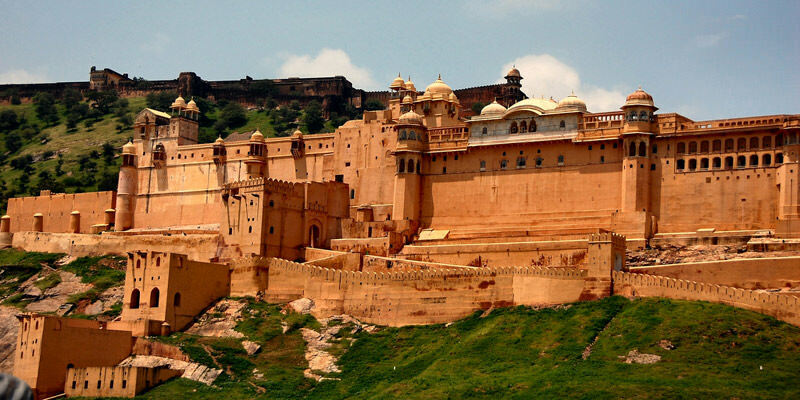 If you are not able to make up your mind from the tour itinerary or hotels listed above in "Explore Royal Rajasthan with jaisalmer 7 Nights Packages", then we can also make the changes and provide a customized, tailor-made vacations, especially for you. We can modify this tour package as per your date and budget. I want to visit Rajasthan w.e.f 24/03/18.Kindly intimate availability of summer package.Total number of persons= 2 adults +1 child(14 yr).Also let me know the total cost.I also want to avail LTC ,Kindly advise.